"It was amazing," remarks Melvyn Price on the recording of his magnum opus Rhythm and Blues, first committed to vinyl nearly thirty-five years ago. Although the record was the result of many years of hard work and a blind leap halfway across the globe, it was one peculiar incident that foretold the evening's magical potential. "Before I went to the studio, I was going to make my lunch," recalls the conguero/trombonist. "So I broke the first egg into the frying pan and it was twins. Now I got two yolks in the frying pan. And so I broke the second egg and there were also two yolks in there. And I had a lot of food from two eggs. I said, ‘Wow, does this mean something?'" For Price, this evening would yield Rhythm and Blues: a medley of Scandinavian chops and Latin percussion that, though never making huge waves stateside, was a mild phenomenon in Price's adopted Sweden. It has spent the last three decades in relative obscurity until this well-deserved reissue. This LP is available for download right now Wax Poetics Digital! Born in 1946, Price grew up in Pontiac, Michigan, a working-class city on the outskirts of Detroit. Although Price played trombone in the marching band, he became fascinated by the free-folk music associated with the burgeoning beat movement of the early '60s. With a diverse musical palette, equal parts Motown and Bohemia, Price formed the Afrikan Folk Ensemble as a means of spreading a more eclectic musical message across Middle America. As political tension stemming from the civil rights movement and the Vietnam War mounted, the Afrikan Folk Ensemble's performances gradually shifted from the intimate confines of coffee houses to the dynamic surroundings of protests and rallies. These same pressures started to take their toll on Price, who, once draft enforcers came looking, fled to Europe with a conga on his back. "Sweden was a country of jazz back then," reminisces Price. "Dexter Gordon—these people were big-time. And jazz was king! Turn on the radio, you'd be lucky to hear a James Brown tune. It was like that. Jazz was everything here." After meeting and marrying a young Swedish girl, Price would return to the U.S.—but only momentarily. With his first son on the way and social tensions mounting, the two longed for an environment more befitting for a young family. In the wake of Martin Luther King Jr.'s assassination, Price returned to Sweden for good. His first musical engagement was as trombonist for Al Sharpe and the Funky Flames. Sharpe, a native of Sudan, had assembled a predominately European band specializing in the pop music of Price's homeland. This would seem a natural transition into the soul-jazz styling found on Rhythm and Blues, but Price took a slightly more scenic route to arrive at this destined recording. During the late '60s and early '70s, jazz ballet was the aerobic activity of choice for most active women. Price began joining his friend, Trinidadian percussionist Rupert Clemendore, on his gigs at the Stockholm Ballet Academy where the two would provide rhythmic accompaniment for the dancers. Price's client and eventual producer, Doris Aronsson, approached Price with a bright idea. "She said, ‘Hey, you sound great. But there should be an album made just for dancers,'" Price recalls. "So we worked on that, but no one would give us a recording contract. I went to one record company, and the man says, ‘Well, this type of record, there's no market for it.' So he gave us some materials and said, ‘Hey—just do it yourself, because it's not going to sell nothing.'" In 1970, Price and Aronsson released Jazzbalettrytmer (Jazz Ballet Rhythm) on their eponymous Mel-Dor label to the delight of the European dance community. The following year, Price capitalized on his musical momentum by recording Rytmer II, which would be met with greater enthusiasm, crossing over into jazz markets despite sparse, primarily percussive instrumentation. By 1974, after completing two years of composition and theory training at Stockholm's University College of Music Education, Price was ready to complete his musical trilogy. 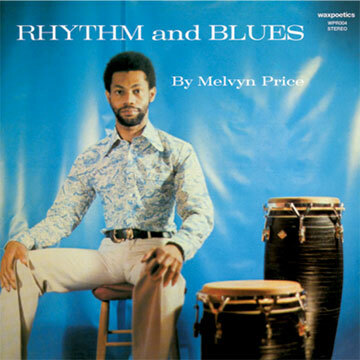 Thousands of miles away from Pontiac, Michigan, Melvyn Price made a bold musical statement with a bold name: an album fit to be called Rhythm and Blues. Despite the record's timeless nature and brilliantly simple format, few of his conspirators appreciated his leisurely progressive vision. "At that time, you would say, ‘Hey, man, it's paying so and so much or would you rather wait for the royalties?' Everyone was so desperate back then, they'd say, ‘Nah, man. I want my money now!' Some of the guys didn't even believe in what I was doing in the studio. They would just say, ‘Ah, man. Give me my money!' It was that sort of thing—cut and dry." Rhythm and Blues would do reasonably well in and around Europe, completing, for the most part, the last chapter in Melvyn Price's musical biography. He still lives in Sweden where all three of his children, Magnum, Mingus, and Marcus, are active in the Swedish music scene. They are following a path paved in part by the events of a one fateful night in 1974 when the elder Price cracked a few odd eggs.